Rice bean (Vigna umbellata) is one of the top five most commonly grown green manure/cover crops in the world. Rice bean comes highly recommended by Roland Bunch (author of Two Ears of Corn and frequent speaker at ECHO’s annual agricultural missions conference). In a recent article about green manure/cover crops, he ranked rice bean high in its ability to grow in poor soil, resistance to drought, and resistance to shade. He ranked it average among other legumes in nitrogen fixation at about 80 kg/ha (compared to 130 kg/ha for lablab) and average in controlling weeds. He ranked it very high in taste. Among the most important cover crops in SE Asia, rice bean is versatile, easy to grow, quick maturing and heavy producing. It has tremendous potential to improve nutrition for humans and animals and to improve the fertility of the soil. Today it is primarily cultivated in India, Burma, Malaysia, China, Fiji, Mauritius and the Philippines. It is also known as Phaseolus calcaratus and Azukia umbellate. This versatile green manure/cover crop is used by farmers for maintaining or improving soil fertility, controlling weeds and providing nutritious food for humans and animals. It is a practical nitrogen-fixing green manure crop that improves the soil. Stems can be cut and used as animal feed or mulch. Vines can be cut for hay when pods are half grown. Leaves can be fed to chickens. It is valuable as an erosion control when planted on slopes, and smothers weeds easily. There are both climbing and bush types of rice bean (see Figure 3). It can be grown as an annual or perennial. The bush can be 30 to 75 cm (12 to 30 inches) tall. Trifoliate leaves grow thick on the stems providing a dense ground cover. Yellow flowers are followed by round pods in heavy producing groups of 5 to 12, about 10 cm (4 inches) long. The plants are short day plants (i.e. they require short days to flower). Seeds are ready for harvest 90 to 120 days after planting, depending on the time of year it is planted. Seeds come in different colors: yellow, brown, red, violet, ivory, and black. The seeds are about the size of a grain of rice, which may be why it is called “rice” bean. Rice bean has a wide range of environmental habitats, from hot humid to hot arid. It will not do well in waterlogged conditions. It is planted in rice paddies after rice harvest (during the dry season) to add nitrogen and humus to the soil. It can also be grown in rotation with crops like maize and millet. Seeds are easy to harvest from these heavy producing plants, and pop open readily when dry. The pods mature at one time so one harvest is all that is needed. The dry pods tend to shatter, so harvesting should be done in the morning when moisture is higher in the air. The seeds can be stored for long periods and retain high germination. Germination can be enhanced with presoaking. They are very resistant to insect pests. Of special note is that they resist the cowpea curculio even though rice bean is in the same genus as cowpea. We have had problems with wild rabbits at ECHO eating the seedlings. Protecting the young plants by sprinkling blood meal on and around plants has worked. A great advantage of rice bean as a green manure/cover crop is that it provides a tasty and nutritious human food. Rice bean seeds can be used as a pulse (dried seed), vegetable sprouts or as green bean pods that stay tender on the vine a long time. 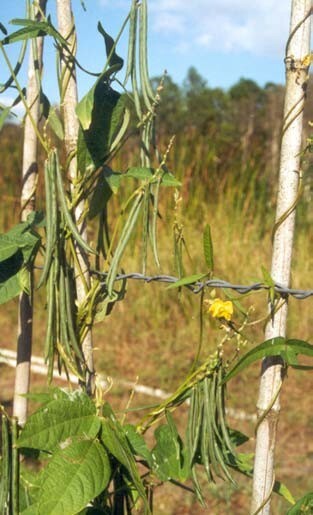 The young leaves and immature pods can be steamed and eaten (when the plant is 40 to 60 days old). It is often cooked with rice and can also be used instead of rice in stuffing. It can be cooked in soup or stew. Sprouted rice beans are a good source of zinc. Rice bean offers a valuable source of protein for humans and animals. The total protein content is 20-23%; it also has high calcium and carbohydrate content. Nutritionally it is comparable to traditional pulses. The 3.2-4.4% crude fiber helps with the digestibility of the legume. Rice bean has proven to be a successful plant at ECHO and it possesses characteristics that make it an ideal green manure/cover crop. We are impressed with its quick maturity, heavy production and uniform seed set. Those working in agricultural development in developing countries may request one free sample packet of Vigna umbellata (rice bean).